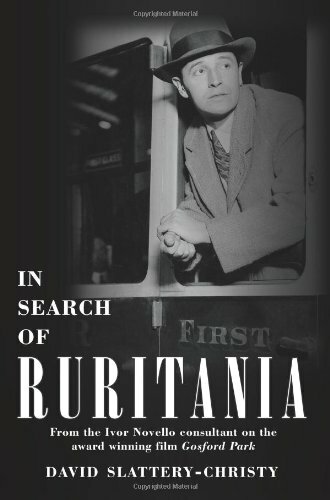 IVOR NOVELLO new edition of IN SEARCH OF RURITANIA to be released on 6th December - to feature on BBC Radio 3 COMPOSER OF THE WEEK on Ivor Novello, Christmas, 2016.Listen in 26th - 30th December daily at 12 noon. "David Slattery-Christy is a writer very much in tune with British societyduring the first half of the last century...it has served him brilliantly with his two well-researched biographies [on Lily Elsie & IvorNovello]. David has an amazing gift for bringing back to life the bustle and allure of London's West End in the days of Daly's and beyond." Raymond Langford Jones - Sardines Theatre Magazine"An absorbing and thoroughly engaging read, and a must-own for fans ofAltman's film looking to learn more about Novello and his work, with special insights into the filming of the late Robert Altman's brilliant film Gosford Park; straight from the film's Ivor Novello consultant."